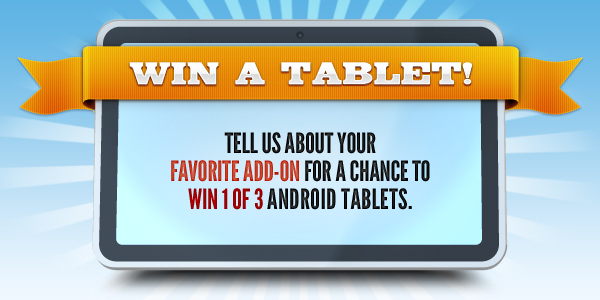 Tell us about your favorite add-ons for a chance to win one of three Android tablets! Update: The winners have been chosen! In 200 words or less, tell us how your favorite Firefox Add-on makes your day more productive, saves you money, or just makes you happy. A special panel of judges will pick 10 finalists, and the AMO community will pick 3 winners. Each winner will receive an Android tablet and be featured on the addons.mozilla.org homepage! How creative is your use of your favorite add-on? Does your review capture the “spirit” of the AMO community? Voting will end on or about July 18, 2012, and the winners will be announced on or about August 1, 2012. Ken has been volunteering for Mozilla since 2005 and is the creator and project manager of Access Firefox. He’s also an Add-ons developer, Mozilla Accessibility steward, and a self-proclaimed add-ons junkie, with 56 add-ons enabled (68 installed). Courtney has been a Persona designer and reviewer for over a year. Her Personas adorn the browsers of hundreds of thousands of Firefox users, who love her sparkly, flowing designs. Jorge is the Add-ons Developer Relations Lead at Mozilla. He manages the add-ons review team, add-on compatibility, and documentation. You’ll usually find him in his native Costa Rica, glued to his laptop and avoiding sunlight. Matej is Mozilla’s resident copywriter and all-around word guy. When he’s not working on a website or campaign, you’ll likely find him in a spirited debate about some obscure point of grammar or style—either with someone else or himself. Ok to use a previously written review, or edit an existing review. Does not have to be new. My favorite add-on is the internet download manager cc.I love this add-one because i can download every thing very fast and easy.I am using this for more than one years.with this i can saving time.this really very helpful for me. Приветствую дополнение повышающие безопасность пользователя, поистине почти всем маст-хевв, это No Script и Adblock Plus. Вопрос почему? Да как всегда, человеческий фактор, ну зайдет пользователь на сайт вредоносный, 100% зайдет, что-бы вы не делали, все мы грешны, и ловим на таких сайтах троянцев и прочих червячков, имея No Script мы уже защищены на 50%, иногда и полностью, а это класс. Из практики ПК с Фаерфоксом и плагином No Script проработал пол года, на нем не стояло никакого антивируса, да-да вообще ничего, и после полу года была сделана проверка – что думаете нашлись вирусы? ?…Нет, вирусов не было, все что можно было словить заблокировано No Script, вот так. like a first timer i jumped in firefore, i did not want too much as i am football fan all i wanted is just to get a sure link to my interest which is to get live update from around the world about football, after searching and surfing for a long time i stumbled into the add ons manager and to my surprise saw what blew my mind and thats is the FOOTIEFOX, this add on gave me more than comfort as a football fan, now i am better informed i really like this. I have been using Firefox for about 4 years, I love it. With all add ons. You can use as many as you want. No wondrer Firefox is used by so many people. I love using Firefox to me it’s no 1. My favorite add on is the Personas for Firefox. I love how i can customize the look and feel of the browser just by using this add on. Indeed, the best add-ons in Firefox. I use it every time. Very helpful and practical use. I use it for a lot of interest, and I’ve been using firefox in operating online application in my work. Cool pre views is the best addon time saver. My favorite add-on is BlockSites, Adblock. i like them both. My fanourite add on is Firebug. It is very very help ful. I have a add on called browser background which have a superb pics while opening a new tab. I love that add on. I was have IE as a default browser but later i moved to firefox after getting good stuff in it. I love Lasspast and Xmarks because with these Addons I get pretty much all browsers Synced with same Passwords and Bookmarks. Very handy indeed. i have been using Mozilla Firefox for about one year.i am using add on is lavafox v2-green .because i am a migraine patient so i can’t look on bright light theme of add ons.lavafox-v2 -green is not too much of bright light and different looks also.this theme giving comfort for me,thank you very much …..
My favorite add on is the Personas for Firefox. I love how i can customize the look and feel of the browser just by using this add on and the smooth scrolling is spectaculas!!!! I’ve been using Firefox for years. It is kinda hard to narrow down to one favorite add on, but currently I’ve been using Personas Plus 1.6.2 to rotate through my many favorites and try out new personas. The next one in line of my favorite add on is Collusion 0.16.3 to check on those snooping on me. “Xmarks 4.1.0” = With this I Synchronize with Bookmarks and password.it is the most secure way to get syncd. trust me and use it. “ADBLOCK PLUS 2.0.3″=IT IS ANOTHER MOST IMPORTANT ADD-ON. use this to block any types of unnecessary advertisement for your safe browsing. I have been using Firefox for about 5 years, I love it. With all add ons. You can use as many as you want. No wondrer Firefox is used by so many people. I love using Firefox to me it’s no 1. Adblock plus, smoothwheel and flashvideodownloader hands down! Firebug is really awesome ……………………………………….. I love the Context Search add on. Works really great. Now I can select the best search engine for all of my searches. Thank you Firefox for this add on. There are so many addons that it is hard to find just one to review. I love the facebook add on and the personas! I have the pink fox persona now and it is AMAZING!!! I found add block plus very easy to use. Plus I really like flashblock it is a very useful add too ! Add-on for blocking sites “Adblock”. 3 hours to go according to the contest rules, but the submission form is down. Hi Solace, the entry form was closed 3 hours early by accident. I have emailed you with information on how to submit your entry. Apologies for the inconvenience. Hi omarce, the entry form was closed 3 hours early by accident. I have emailed you with information on how to submit your entry. Apologies for the inconvenience. adblock is the best one! Lasspast is a great tool. Love it everyday! Go FF!!! !